Clean water is a luxury; one in eight people around the world lack access to supplies of the stuff, and unsafe water is responsible for 60% to 80% of all disease in India alone. 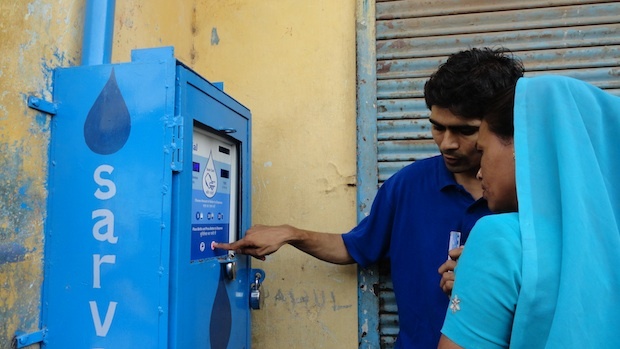 There are plenty of possible solutions–new wells, pricey community water filters–but an organization called Sarvajal has devised a fix that is rapidly spreading across India: solar-powered water ATMs. facilities that leverage local cellular networks to remotely keep track of quality and quantity. “One of the objectives when we first started [in 2008] was to create a market-based mechanism of health care,” explains Sameer Kalwani, CTO of Sarvajal. Hence, the solar-powered water ATM, a device that gives customers in rural areas access to clean water any time with the use of a pre-pay card that can be recharged via cellphone. Here’s how the water ATM processed works: local franchisees–people who want to make money as water stewards for their community–are allowed to operate ATMs in their villages. They pre-pay Sarvajal for water, and pick it up to dispense into the ATMs, which treat the water with reverse osmosis and ultraviolet rays. Community members get their pre-pay water balances from the franchisee, who is allowed to keep all cash from home deliveries. If something goes wrong with one of the cell phone network-connected ATMs (i.e. a leak), Sarvajal finds out immediately and fixes it. Sarvajal’s franchisee network is growing fast. So far, there are 120 facilities in India serving 60,000 people for the price of less than $3 per month per family. In remote areas where clean water was impossible to come by before, this is more than just a luxury–it’s a potentially life-saving technology.